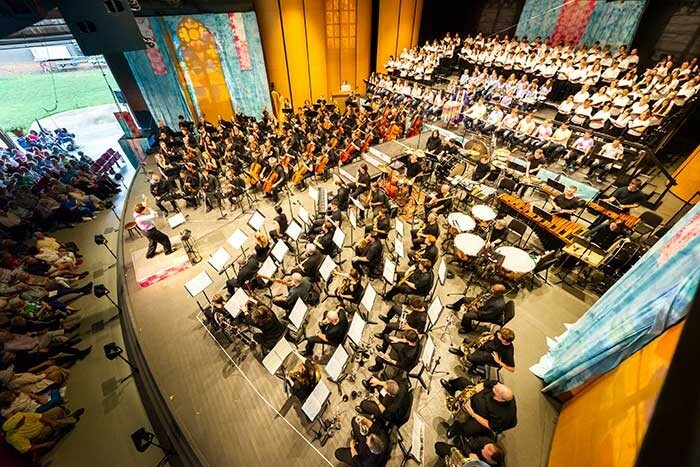 USA – Honouring the intentions of composer Leonard Bernstein, the artistic director of the Brevard Music Center Summer Music Festival, Keith Lockhart, set himself a task: to capture the pioneering spirit of a classic performance in a contemporary environment. Composed for the 1971 inauguration of the Kennedy Center, Bernstein’s “Mass” created an entirely new kind of liturgy in both its content and technology, using quadraphonic sound. “Keith is a renowned conductor, not least as principal conductor of the Boston Pops. He had performed the Bernstein ‘Mass’ once before and wanted the audience to have that quad sound experience as Bernstein had originally intended,” explained sound engineer Brady Hislop of Iris Design. Iris Design is a partnership between Hislop and Bobby Bradley; Hislop has a theatre degree from Earlham College, Bradley’s expertise is in video. Forged in 2006 with roots in New York City where the two met, they worked many projects together in the realms of live music, theatre, and broadcast. The relationship with the Brevard Music Center Summer Festival began at that time; later, Iris Design relocated to North Carolina and they were promptly appointed house vendor. “We started out with a used pair of d&b Q7s, four MAX monitors, a couple of new D6s, some E3s and Q-SUBs. We’ve been using and investing into d&b systems ever since. Bernstein’s intended form of “Mass” is quasi-theatrical in performance and features three choirs: formal, boys, and street singers. As well as an orchestra, it sees a marching band and rock band take part. Lead voices move physically about stage within the narrative, while a significant flute solo is moved around the listening environment; one of several poignant emotional highlights. “The show starts with two singers almost shouting at each other, figuratively across the audience; we were able to create exactly that experience. We used the En-Scene function of Soundscape and adjusted different groups of mics, so inputs run through via console to R1 then the DS100 engine. The show moves very quickly through jazz, to rock, and choral, so we also used some room emulation signatures (En-Space) when the music source required it. Some needed a touch of reverb, elsewhere we needed something very clean to leave the voices distinct and discernible. With that ability we were able to make it all of a piece, even the pre-recorded stuff just blended right in.” Readers might be interested to learn that Hislop had access to the original tracks recorded at the “Mass” world premiere and used them for this performance. 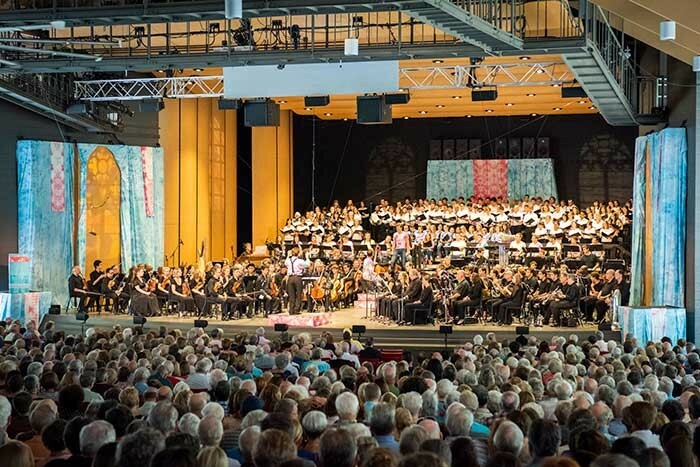 Considering the performance schedule and the high profile nature of the Brevard Music Center Summer Festival, Hislop’s decision to use this new d&b software platform was nothing if not audacious. “We loaded in the extra loudspeakers and amplification overnight on Tuesday and had 90 minutes the following morning to tidy up and ping the loudspeakers and make sure all was working as it should. Then there was a full program of rehearsals and performances for the next four days of other planned concerts. “We had six rehearsals in all. We had mics for the three choir elements, the principal singers were on cardioid mics, and within En-Scene we were easily able to drag them around the sound environment as they moved around the stage, so what the audience heard always matched to where they were. We also put mics into parts of the orchestra, not to amplify what they were playing but to be able to place them authentically within the ‘spatial environment’, to make it all sound and be more natural in the listening experience. For the audience they would never have known, the experience is so natural. Yes, they’d recognise the solo voices were amplified to get above the orchestra, but the orchestra itself sounded completely live so it all became one big environment.